Civic leaders and government officials have struggled for nearly a century to define blight and deploy effective policies and programs to address its community impacts. Blight encompasses vacant lots, abandoned buildings, and houses in derelict or dangerous shape, as well as environmental contamination. 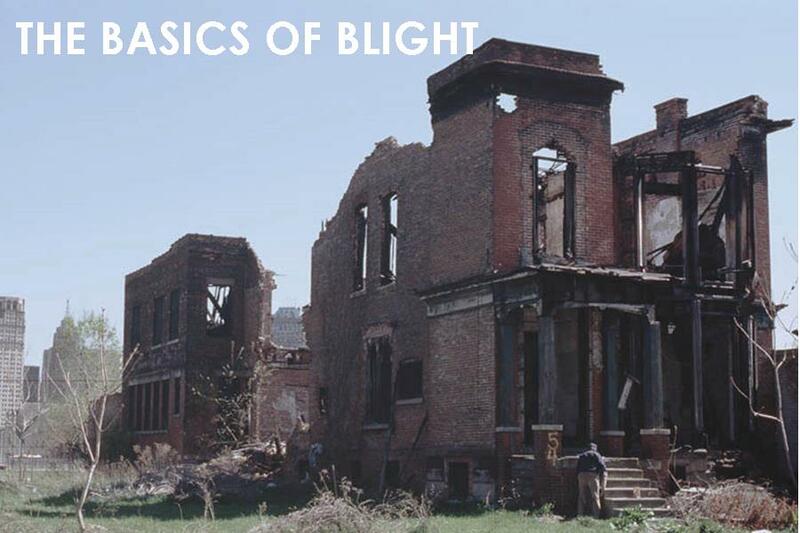 Blight can also refer to smaller property nuisances that creep up on cities and suburbs: overgrown lawns, uncollected litter, inadequate street lighting, and other signs of neglect. Blight’s legal and policy foundation can be found in longstanding principles of public nuisance: property conditions that interfere with the general public’s use of their properties. Although there is wide debate about what exactly blight is and how people should talk about it, the most useful description is “land so damaged or neglected that it is incapable of being beneficial to a community without outside intervention.” Thus, blight may be defined not so much by what it looks like, as by what it will take to reverse it. Blight is no longer just a pressing problem for older industrial, legacy cities, but concerns fast growing cities in California, Arizona, Nevada, and Texas thanks in large part to the recent mortgage foreclosure crisis spreading the blighting influence of vacant homes to once stable neighborhoods. The direct cost of addressing the issue can be staggering for any community as local code enforcement officials are called upon every day to abate derelict properties, remove graffiti and cleanup vacant lots with little chance of recouping all of their costs against neglectful property owners. Although the term blight seems more popular today, researchers note its long and complex history within the academic literature. Scholars from different disciplines have documented blight’s evolution from its genesis in the early 1900’s to describe the spread of slums and disease, to blight’s racial legacy as the legal touchstone for many eminent domain actions that broke apart predominately African American communities throughout hundreds of American cities. This research translation brief offers a synthesis of the relevant research findings and then explores their significance for practitioners and policymakers trying to eradicate and remediate blighted properties in their communities.